With every third part in a successful trilogy comes the different question: Do you stay with the same winning structure that has proved so lucrative with the previous instalments, or do you shake things up in a bid to present the audience with something fresh? Director Todd Phillips and screenwriter Craig Mazin have opted for the latter with The Hangover Part III, though it’s not executed in a particularly memorable or laudable fashion. When life proves too much for Alan (Zach Galifianakis), the other members of the Wolfpack – Phil (Bradley Cooper), Stu (Ed Helms) and Doug (Justin Bartha) – decide to ship him off to a rehab centre for professional help. Their trip quickly spirals out of control, however, when they’re intercepted by Marshall (John Goodman), a nasty mobster who kidnaps Doug and sends them on a mission to find Chow (Ken Jeong) and return his stolen millions. By flipping the structure on its side, Phillips has made a bold move – one that has to be admired considering how easy it would have been for him to simply churn out another copy-cat instalment. Unfortunately for him though, it’s not one that pays off. Where The Hangover Part II’s central fault was that it copied its predecessor entirely, albeit in a different location, The Hangover Part III’s is that it’s a mess, pure and simple, with only the reliable chemistry between its leads to keep it afloat. The central difficulty with The Hangover Part III, aside from the fact it rips off what it’s fanbase have come to love, is that it asks far too much of its audience for it to be the enjoyable action-heist caper it so desperately wants to be. Mazin’s script, too, flips through so many different tones that it’s hard for the audience to keep up and to know what to expect next, with everything from mental instability to domestic abuse touched upon but never properly explored. In that respect, the comedy takes somewhat of a back seat, with various gags haphazardly sprinkled about the place in an attempt to liven proceedings up. For a series that pole-vaulted to success thanks to its mystery-comedy approach, and rehashed that with its follow-up, there’s nothing even remotely similar on display here, mid-credits scene aside, that would assume that it’s been cut from the same cloth. What’s left, then, after all that, is a deeply unfunny mess that doesn’t even use its cast wisely. Cooper, Helms and Bartha (reassuming one of the most thankless roles in cinematic history) are pushed to the side while Galifianakis and Jeong take the reigns, though both play such inherently irksome characters that they more than overstay their welcome come the end. 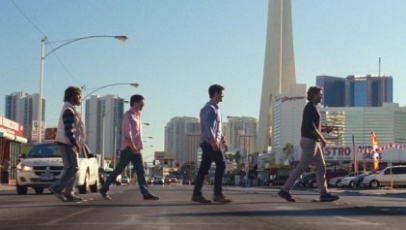 To say that The Hangover Part III is the worst of the trilogy would be a lie. Then again, it’s no triumph by a long shot. i definitely laughed several times, actually. but, yeah this was stale overall.